Time for God: Be patient, He said. Patience, defined: An ability or willingness to suppress restlessness or annoyance when confronted with delay. Patience, synonyms: Endurance. Humility. Poise. Restraint. Self-Control. Composure. Diligence. Persistence. Perseverance. 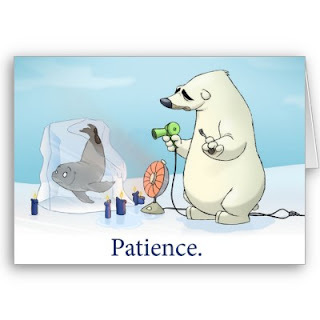 Patience, used in a sentence: I HAVE NO PATIENCE! Let's face it, patience is not something many of us have, no matter how hard we try. We are so busy living our lives, trying to fit as much as we can into each day. Its no wonder why its hard for us to be patient! It seems like no matter where we go or what we are doing, we have to hurry up to hold on. Whether its getting stuck in traffic, standing in line at the grocery store or waiting on a call back from the doctor's office, there is always a time to wait. So why is it that it takes so much out of us when we have to have patience? I'm fairly sure that having patience isn't a new struggle for folks. But I am also fairly certain that our society today only makes it worse. We live in a world of instant gratification. Fast food, online searches (no need to get in the car and drive to the library), microwaves, streaming of TV shows (without commercials), credit cards (no need to wait until you save enough money!). When we want it, we can get it. Everything is instantaneous. So when we actually have to stop and wait, its hard for us to get a grip on our patience. In fact, as I am writing this blog, I am with my mother who is waiting on a nurse and a plumber. Each gave us an appointment time so we adjusted our schedule to account for their visits. The appointment times have come and gone. Yet neither party has arrived yet. We hurried up to get ready just so we can sit here and wait. I just heard the line, "I hate waiting." Don't we all?! I found myself in a similar situation earlier in the week. I felt as though I was being tried and I couldn't get a hold on my patience. My anxiety was increasing, my leg was jittery, I found myself pacing and my thoughts were racing. I knew I needed to get a grip. So, I decided to open a one-minute daily devotional I carry with me. Guess what the message happened to be for that date? First, it referenced the following scripture: "For you have need of endurance, so that after you have done the will of God, you may receive the promise." - Hebrews 10:36. It went on to remind me that God is in control. He does things in His time and I am not to set a timetable of my own for anything. God sometimes makes us wait not to aggravate us, but to mold our character... after all, he is the potter. Just another moment that I do not contribute to coincidence... I am amazed each time situations such as this arise. His message came in the exact moment I needed to hear it. Had I not been in such a state, I probably would have read it and moved on -- not getting consumed by what He was trying to say to me. God definitely has a way of making sure He makes an impact with his timing!